being the major integrative elements involved in the further downstream processing of synaptic signals, which is not discussed here, dendrites provide the receptive surface area for synapses. With respect to the mechanisms underlying synapse formation, dendrites were therefore considered as somatic protrusions aimed at increasing the synapse-receptive surface area by simultaneously economizing volume. For example, 97% of the 370,000 |xm2 of somatodendritic surface of motor neurons is dendritic and engages as little as 300,000 p.m3 2. Considering that 80% of the surface area of proximal motor neuron dendrites is covered with synapses suggests that the number of synapses might indeed correlate with the size of the synapse-receptive area3. In contrast to this, the axon often extends far away from the neuron soma, arborizes at its termination zone, and covers only 1-2% of the neurons total surface. Axons thus ensure the propagation of the result of dendritic integrative processes to target neurons, which may actually be localized at considerable distance to the former neuron. Therefore, by modulating axon path finding or axon and dendrite geometry the synaptic connectivity may also be affected. Indeed, the synaptotrophic hypothesis4, according to which new dendritic branches grow out at points of synaptic contacts that in turn stabilize the newly formed branches was recently supported by the elegant experiments of Smith and colleagues5; see also Chapter 20. With respect to the potential role of dendrite arborization in the assembly of new synapses they reported that the formation of a glutamatergic synapse occurs at newly extended dendritic filopodia and that the concomitant recruitment of the postsynaptic neurotransmitter receptor anchoring protein postsynaptic density 95 kDa (PSD-95) stabilizes the corresponding dendritic filopodium, which subsequently matures into a dendritic branch5. Figure 21.1. A Scheme Exemplifying the Intracellular Signal Processing Machinery Composed of Protein Kinases and Phosphatases and Their Impact on Cytoskeletal Dynamics. (A) The information content of a physiological cue from the extracellular milieu is determined by the functional interplay between protein kinases (white rings) and phosphatases (gray circles) and is finally communicated to the respective effector proteins, such as MAPs, scaffolding proteins, and neurotransmitter receptors. As kinases and phosphatases are themselves phosphoproteins, their enzymatic activity influences each other, either in a stimulatory or inhibitory way (±). (B) Principle of phosphorylation-dependent regulation of cytoskeletal dynamics. Dephosphorylated MAPs bind to microtubules and thereby contribute to their stabilization, bundling into parallel filaments and elongation. Phosphorylation of MAPs provokes conformational alterations responsible for the observed lower binding affinity to microtubules. Phosphorylated MAPs thus dissociate from microtubules, destabilize them, and increase microtubule dynamics, which favors arborization. (C) Actin cytoskeleton and regulation of growth cone advance or collapse through phosphorylation of myosin light chain (MLC). Parallel actin filament bundles and branched filamentous actin co-exist in the growth cone. The appearance of parallel actin filaments is promoted by actin-binding proteins, such as a-actinin, and active, phosphorylated MLC (phospho-MLC), which exerts traction forces on actin bundles. Branched actin filaments occur in case of cross-linking through larger actin-binding proteins, such as filamin. Besides this, actin-related protein 2/3 (Arp 2/3) binding to actin nucleates the assembly of new filaments on already existing ones and produces a network of short and branched actin filaments, which is more effective than unbranched filaments in pushing the leading edge forward (see also Figure 21.2). 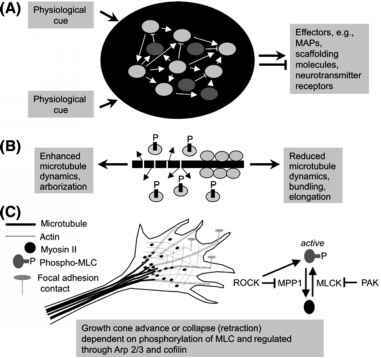 Thereby, the relative MLC phosphorylation status determines the net direction of the growth cone movement (either forward powered by dephosphorylation of MLC or backward powered by phospho-MLC). MLC is a substrate for myosin light chain kinase (MLCK) and the phosphorylation status of MLC is modulated by several protein kinases and phosphatases. Rho-associated coiled-coil containing kinase (ROCK) inhibits myosin protein phosphatase 1 (MPP1) and phosphorylates MLC directly, both leading to myosin activation and promoting growth cone retraction. The p21-activated kinase (PAK) phosphorylates and inhibits MLCK, which promotes the appearance of dephosphorylated MLC, branched actin filaments, and growth cone forward movement. the information processing capacity of, for example, neuronal networks within the CNS. 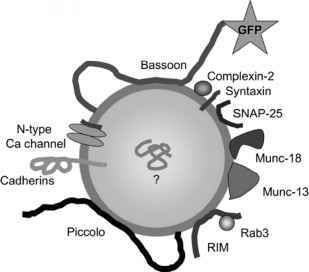 This chapter is therefore focused only on a few selected protein kinases and their effector proteins such as MAPs, scaffolding molecules, and neurotransmitter receptors (Figure 21.1A). Secondly, a few definitions with respect to neuron geometry and synapse formation have to be given here. In this chapter, it will be distinguished between neurites, dendrites, and axons, and between elongation and arborization. Neurites will be addressed as undifferentiated somatic protrusions while differentiated somatic protrusions will be designated dendrites (somatodendritic or basolateral compartment) and axons (axonal or apical compartment), according to the compartmentalization originally found in polarized epithelial cells (see Chapter 13). The terminus "elongation" will be used in its proper meaning, i.e., the extension in length of an already existing somatic protrusion. The use of the terminus "arborization" will be restricted to the process of ramification of already existing protrusions. We will not discuss here initiation, i.e., the outgrowth of new protrusions directly from the soma (primary dendrites). Thirdly, I would like to exemplify here the impact of protein phosphorylation on neurite arborization using a previously established model6-8. To date, it is believed that phosphorylation of MAPs (e.g., MAP2 and tau) decreases their binding capacity to microtubules and thereby favors microtubule destabilization and dynamics. On the other hand, dephosphorylation of MAPs favors their interaction with microtubules, which promotes their stabilization and reduces microtubule dynamics (Figure 21.1B). Consistent with the idea that destabilization of cytoskeletal structures is required for dynamic changes in neurite shape, phosphorylation of MAPs was found to promote neurite arborization9. The elongation of microtubules and, thus, of neurites (arborized or bundled) is mediated by addition of a/p tubulin heterodimers preferentially to the (+) ends and occurs only when a critical tubulin concentration is exceeded. When the addition of tubulin heterodimers is faster than guanosine triphosphate (GTP) hydrolysis (of the GTP cap at the growing end) the microtubule gains in length. Once GTP hydrolysis occurs, however, microtubules begin to shrink. Interestingly, the GTP binding site of tubulins is structurally similar to the nucleotide-binding site of GTP-binding proteins of the Ras superfamiliy. Dephosphorylated MAPs speed up polymerization of tubulin heterodimers as they bind to both tubulin polymers and tubulin monomers (type I MAPs, e.g., MAP1A/B). Dephosphorylated type II MAPs (e.g., MAP2, tau) cross-link microtubules and thus contribute to their bundling. Within the growth cone (Figure 21.1C), which edges the tips of growing neurites, the assembly of actin into filamentous actin carries the aforementioned MAP-dependent processes forward and critically depends on the relative amount of phospho-MLC. The phosphorylation status of MLC is determined by the enzymatic activities of MLCK and MPP1 (Figure 21.1C). PAK phosphorylates and inhibits MLCK, and ROCK phosphorylates and inhibits MPP1 or directly phosphorylates MLC10. According to the treadmill hypothesis, phospho-MLC is associated with retrograde actin flow and assembly of myosin into bipolar filaments and stress fibers (Figure 21.1C), which opposes growth cone forward movement, and, if predominating over dephosphorylated MLC, which powers growth cone arborization and forward movement, stimulates contractibility of actin filaments and withdraws protrusions toward the growth cone center11. Therefore, the net direction (forward or backward) of growth cone movements is determined by the amount of phospho-MLC relative to dephosphorylated MLC (Figures 21.1C, 21.2).